Ever since I got the Holiday Catalog in my hot little hands, I've been on a TEAR making Christmas Cards and projects. Christmas really is my favorite holiday and I adore creating things that make us all look forward to it's arrival! But, these past few days, I guess since Emma went back to school, I've been thinking about Autumn - which is my favorite season - and I've been feeling the pull of all the gorgeous Fall-themed products. They're calling my name, people! Anyway, that Gold Glimmer Paper.....man.....love me some Gold Glimmer Paper. Ok, yeah, rabbit trail - but, you get me, right?? 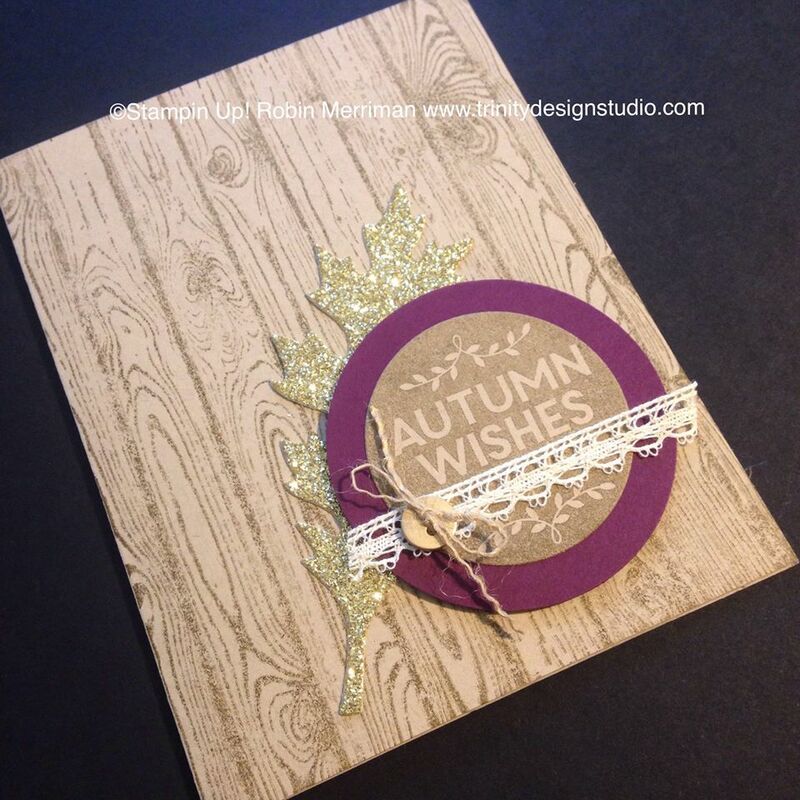 Clean and simple with an unexpected twist - a Gold Glimmer Paper Leaf! It just makes my heart go pitty-pat. The card base is a standard size - 4 1/4" x 5 1/2" (folded) and I used Crumb Cake card stock. My top 10 all-time favorite background stamp was my choice for this card - Hardwood. Love it! If you don't own it, you NEED it. So go order it now. Well, you can finish reading my post, but seriously, go order it. I stamped Hardwood with Soft Suede ink on the Crumb Cake. The color combo reminds me of my Grandma's paneling a bit. I used the new stamp set Among the Branches for the greeting and once I cut it out with the Circles Framelits, I covered the unwanted text (& tasty dishes) with a small piece of Venetian Crochet Trim. The button accent is one of the Gold Basics Metal Buttons threaded with a string pulled from the Burlap Ribbon. This piece was layered on a circle of Blackberry Bliss card stock punched out with the 2 1/2" Circle Punch. I used the Leaflets Framelits to cut it out on the Big Shot and just adhered it to the card front with Fast Fuse Adhesive. The greeting element was adhered over it with Stampin' Dimensionals and that card was done! As always, you can click on the thumbnail photo of any of the products shown above and it will take you right into my Online Store so you can shop for your favorite products and more. The Clearance Rack was updated today AND there are NEW Weekly Deals too, so don't miss them. You can always view the current Weekly Deals by clicking on the tab at the top of my blog page. I loved this card so much, I filmed a LIVE Periscope Broadcast showing how to make it. I'll upload it to my YouTube Channel (Robin Merriman - Trinity Design Studio) so you can see it. If you already follow me on the Periscope app, you can view the replay through 1:30 pm est. tomorrow. Follow me - @trinitydesign95 once you download the app to your mobile device! Have a great evening everyone - see you back here soon! Today's the Day - 2015 Holiday Catalog is LIVE!